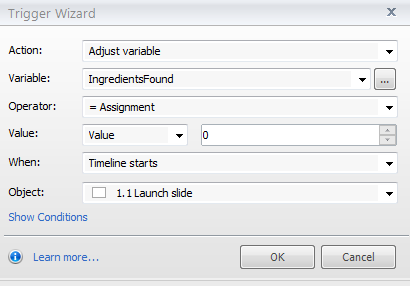 Is there a way to clear or re-set variables if the users revisit the slides without restarting the project. I want to set up a kiosk where different users can use the same project and take a quiz. It works great the first time but the next user sees the previous users answers in the text fileds. It should re-set for the next user. Hi Q - If subsequent users will be restarting the course completely (i.e., relaunching it from scratch), you would just need to disable the resume feature so that each session is treated as a new session. You can do this by setting the Resume prompt to "never." It worked. On the menu button that leads to the slide I created a number of triggers to change each of the variables to "enter text here." The key to making it work was ordering the triggers so that the last trigger was the Jump to Slide. The triggers to reset the variable needed to be completed before it jumped. "It worked. On the menu button that leads to the slide I created a n..."
"Hi Q - If subsequent users will be restarting the course completely..."